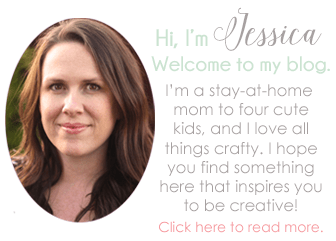 This is a sponsored post written by me for Plaid Crafts (Mod Podge) and Blueprint Social. All opinions are my own. Collage Clay is is not recommended for children 12 and under, and the product is not edible. Small parts are a choking hazard for children. My little Audrey is a treasure collector. Rocks, beads, coins, feathers… you name it. If it’s small, pretty, shiny or all of the above, it’s a treasure and must be saved forever. She’s started a pile of these little treasures, and the time has come to give them a permanent home. 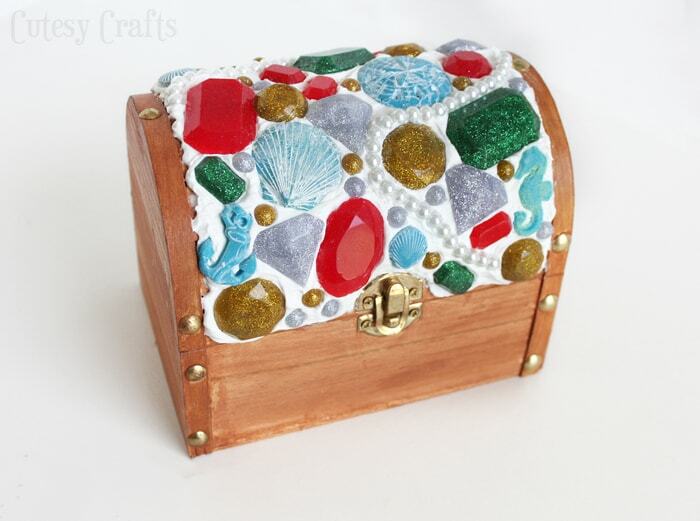 What better place than a treasure chest? Now tell me this isn’t the coolest treasure chest ever! I made it using a new product called Mod Podge Collage Clay that makes it super easy to do. The technique I used is called decoden. Decoden is the art of decorating anything with trinkets, and “the more the merrier” is the name of the game in designing an over the top look in this 3D collage technique. 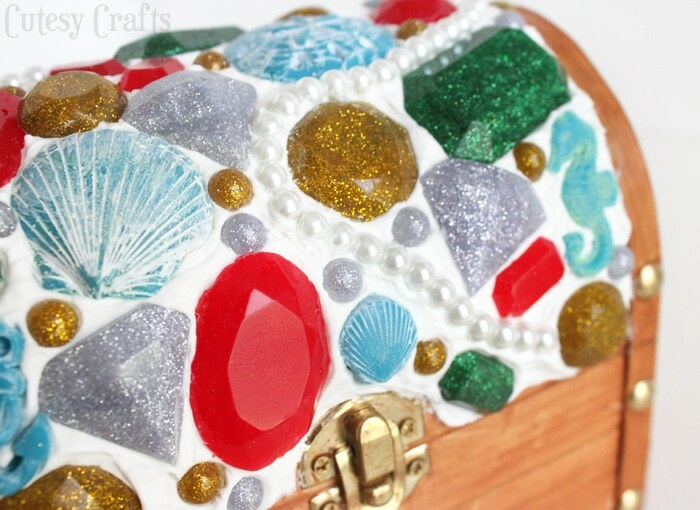 Use Collage Clay with Mod Melts, trinkets, buttons, rhinestones, and anything else you can think of! Mod Podge sent me a bunch of fun supplies to play with. I really want to try out the Drizzle Paint next. It’s great for adding extra drama and dimension to designs. All of this is available at Michael’s. 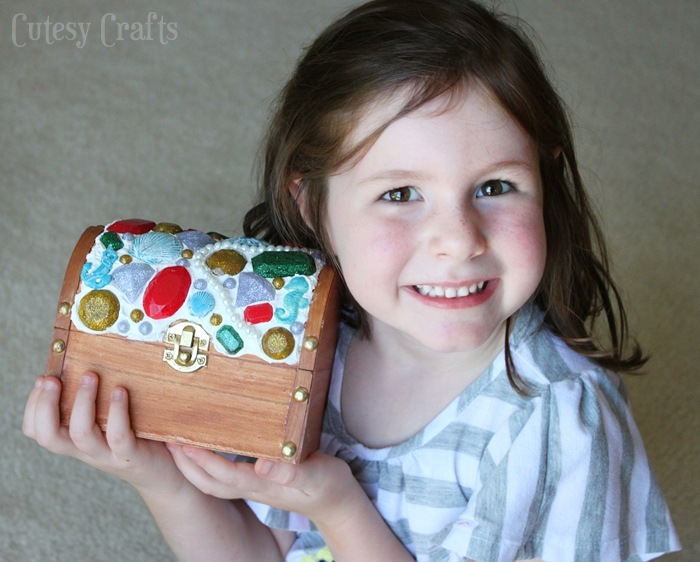 Make make some little jewels and things to put on the top of the chest. The Mod Melts and Mod Molds were perfect for this. 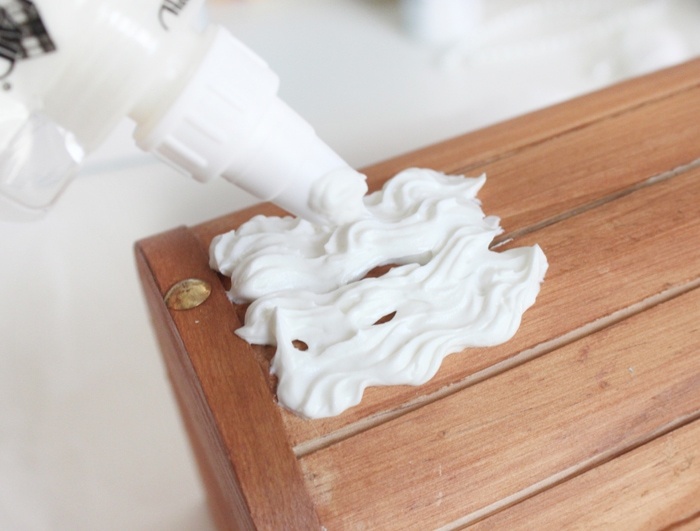 Put the melts into a high temp mini glue gun and squeeze them into the silicone molds. 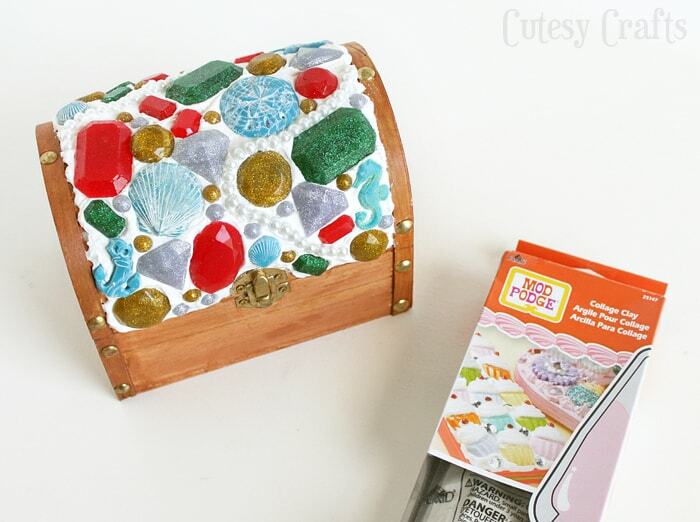 Let them cool, pop them out, and you’ve got some little gems to put all over the treasure chest. 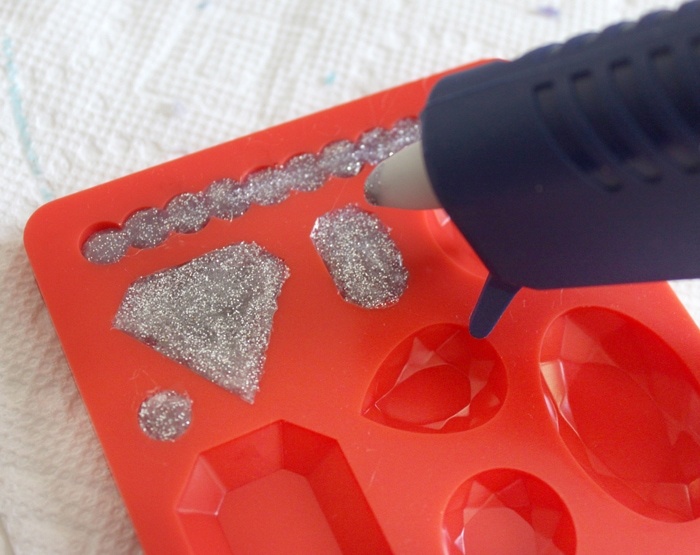 You can paint the melts or decorate them with Podgeable Glitters. 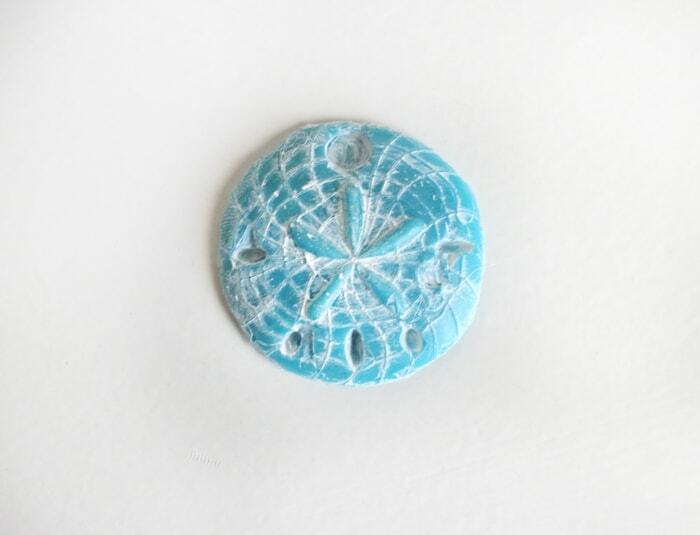 To tone down the colors of the Sea Life melts, I painted them with some white acrylic paint and then wiped off the excess. I found the treasure chest at the craft store and stained it with a staining cloth. Once that was dry, the fun started! The collage clay comes in piping bags with different tips, just like frosting. 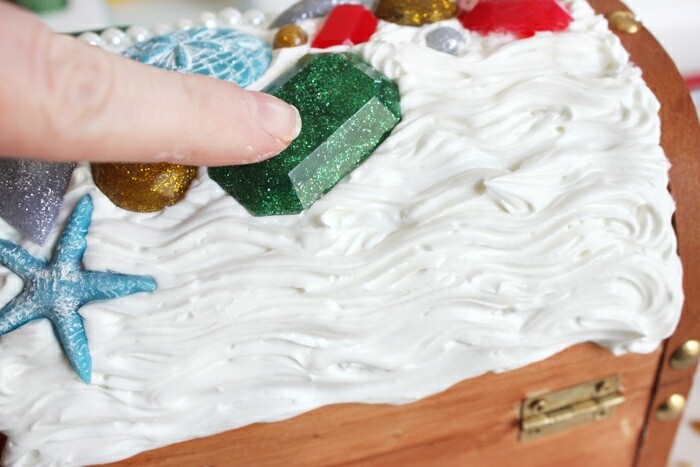 In fact, a lot of decoden projects are made to look like food and frosting. I’m not gonna lie, my piping skills are horrible, but a cake decorator could have a LOT of fun with these! As you can see, piping skills are NOT necessary to make something cool. Yeah… we all have different strengths, right? When I first started, I was worried the clay would drip or dry too fast, so I started small. As I got going, I realized that neither of these were an issue. It doesn’t drip and it stayed soft long enough for me to play around. Just pipe it all over and get creative! The swirly white clay looks sorta like sea foam, right? At least that’s what I was going for. I added a couple small strands of pearl beads to give it a little something extra. Then let it dry. Audrey LOVES her new treasure chest! It’s already being filled with all kinds of random things. And I had so much fun making it! I’m thinking this would make a great pirate’s treasure chest too. What do you think? Got any treasure collectors in your house? 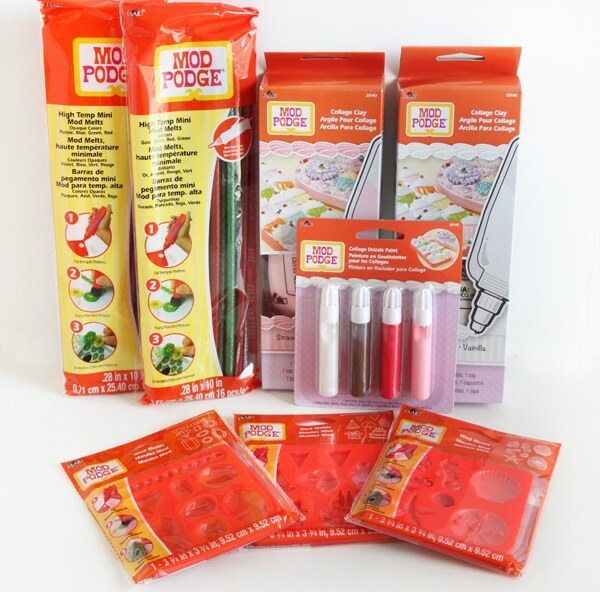 You can win your own Mod Podge decoden supplies by entering Plaid’s contest! Head on over to their blog here to enter. For more information about these products, visit Plaid’s website, read their FAQs or check out this video. 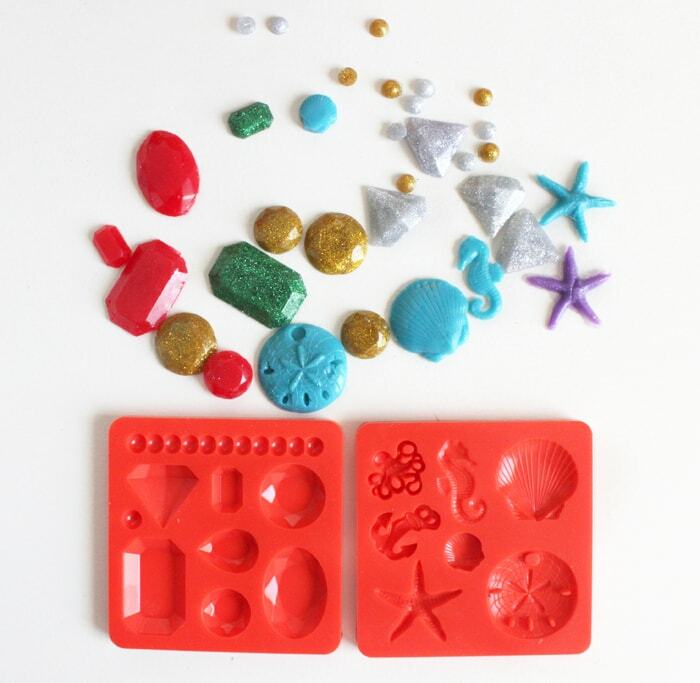 Want more Mod Podge Collage Clay inspiration? Take a look at these and other projects from Plaid here. 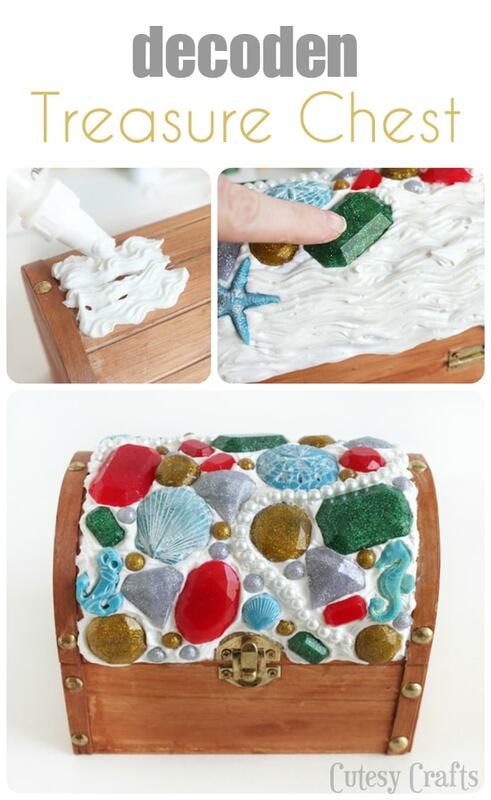 Great post and awesome use of the Mod Podge Mod Melts and Molds! Thanks! Wow, so many fun products to play with! You combined them into the perfect project. And it sounds like Audrey will be getting lots of use out of it! Great job! Thanks, Meredith! I had a lot of fun with it, and Audrey is definitely loving her new treasure chest. Ohh, lovely project, Jessica! It does look like sea foam!